Google just last night released a Maps version of Google Mars. 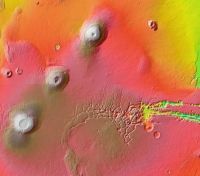 You can choose between Elevation, Visible, and Infared versions of the map which shows high resolution photos of the surface of Mars. And, if you click on the links at the top you will get layers of waypoints showing places of interest on Mars. Clicking on the waypoints gives you more details. 4. Can I see the Mars data using the Google Earth client? Not yet, but we're working on it. 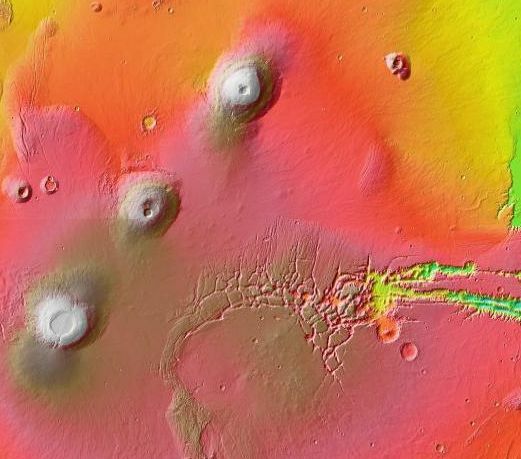 To whet your appetite, you can check out this 3-D fly-through movie of Valles Marineris made using this data. In fact, there is already a Mars forum at the Google Earth Community which comes from the old Keyhole version of the Mars database. I suspect the new version will have even better data. Given they are mentioning the Valles Marineris movie, we have to assume the database will have a 3D terrain layer and we'll be able to fly through the canyon ourselves! Oh yeah, and don't forget to check out Google Moon (and make sure you zoom all the way in). Sure...just type in "face" in the search field of Google Mars. It will take you right there. A link is provided to show photos of the face.